“Video killed the radio star” and then the Dvd killed the VCR! Yes it is the survival of the fittest but don’t throw away your erstwhile nineties gadgets yet as we have many uses for them. ‘Designing with a conscience’ is a mantra that the A&D continuum is taking quite seriously and upcycling as a trend is catching on. Atomic Attic have created quite a presence on Etsy, as it is hard not to succumb to their charmingly vintage designs. 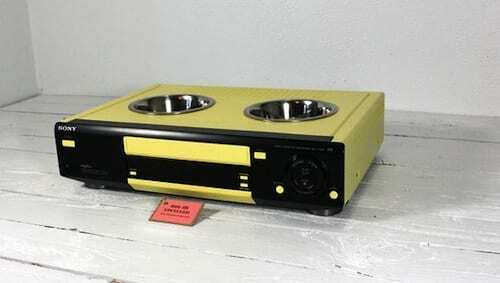 Catering to pet owners, the design studio has garnered a lot of critical acclaim for their trendy TV beds and VCR Pet Feeders. Pictured below is the Upcycled Yellow Television Cat Bed and the VCR Bed And Feeder. The uber-cool designs with their retro subliminal sensibilities defy stereotype and is a must for the trendy pet owner.